Eastern senior Courtney Fitzgerald belts out a single during the first inning of Game 1 on Thursday night against Federal Hocking in a TVC Hocking softball contest at Don Jackson Field in Tuppers Plains, Ohio. 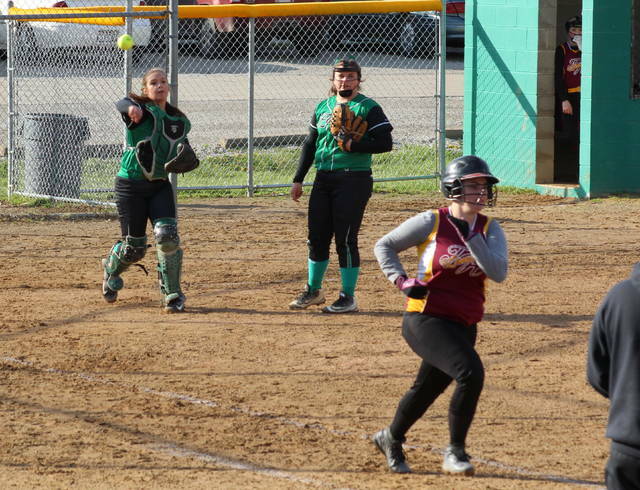 The Eastern softball team scored 42 runs and produced 34 hits over the span of 10 innings while picking up wins of 18-0 and 24-0 over visiting Federal Hocking on Thursday night in a Tri-Valley Conference Hocking Division doubleheader at Don Jackson Field. The Lady Eagles (10-1, 9-1 TVC Hocking) increased their winning streak to 10 consecutive games as the hosts outhit the Lady Lancers 15-5 in the opener, then tacked on another 19 hits while the duo of Elaina Hensley and Tess Rockhold combined on throwing a no-hitter in the night cap. 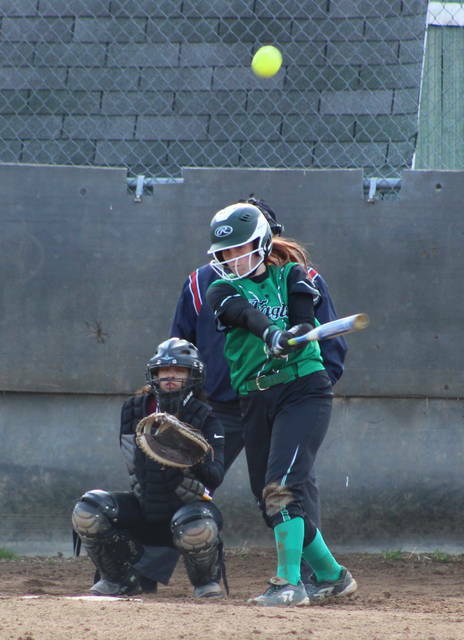 The Green and White sent at least nine batters to the plate in every inning except the third, which was also the only time that EHS didn’t score at least five times in that frame. After building leads of 5-0 and 10-0 through two complete, the Lady Eagles yielded only three runs in the third after sending six batters to the plate. The hosts added five more runs in the fourth to wrap up the 18-run triumph. Cera Grueser singled in Ally Barber just six pitches into the bottom of the first, allowing Eastern to take a permanent lead of 1-0. Sidney Cook also belted a two-run homer to centerfield with nobody out in the bottom of the second. 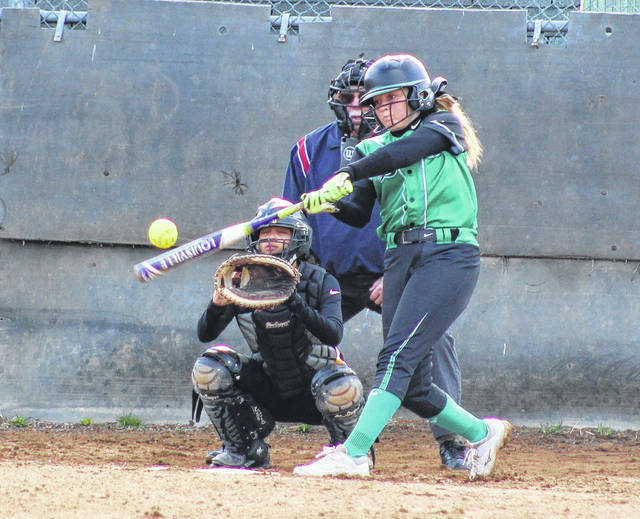 The Lady Eagles not only had three times as many hits in Game 1, but the hosts also benefited from five FHHS errors en route to the shutout victory. Sophie Carleton was the winning pitcher of record after allowing four hits over four frames while fanning three. Hill took the loss after surrendering 13 earned runs, 15 hits and four walks over four innings while striking out one. Eastern had nine different players produce hits in the contest, with Emmalea Durst leading the way with three hits. Grueser, Cook, Kelsey Casto and Faith Smeeks were next with two safeties apiece, while Barber, Carleton, Sydney Sanders and Courtney Fitzgerald also had a hit each in the triumph. Cook, Durst and Casto knocked in three RBIs apiece, with Carleton, Fitzgerald and Sanders also driving in two runs each. Grueser, Sanders, Durst and Cook also scored three runs apiece in the opener. Gould paced Fed Hock with two hits, followed by Dunfee, Simpson and Clemons with a safety apiece. The Green and White served as the visiting team during Game 2, then sent 10 batters to the plate in the top half of the first — which led to four runs on two hits, two walks, two hit batters and two errors en route to a quick 4-0 lead. Grueser doubled in Barber on the fourth pitch of the game, allowing EHS to secure a permanent lead of 1-0. The Lady Eagles tacked on another three runs in the second for a 7-0 cushion, then erupted in the third after sending 14 batters to the plate. Cook capped an 11-run outburst with a two-out grand slam over the centerfield fence, giving Eastern an 18-0 advantage midway through the third. EHS added a run in the fourth and tacked on five more scores in the fifth to wrap up the 24-run triumph. 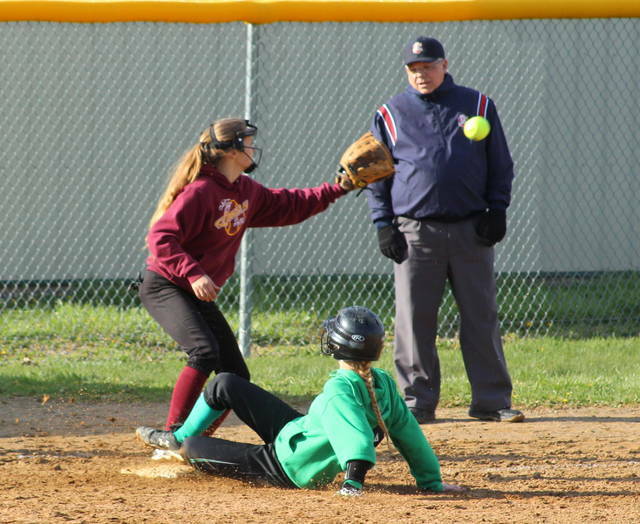 The Lady Lancers had just four baserunners in the game, with two reaching on walks and two more getting on board because of fielder’s choices. FHHS stranded two runners on base, including one at third with two outs in the bottom of the fourth. Hensley was the winning pitcher of record after walking one and fanning three in three innings of work, while Rockhold walked one and fanned two in two innings of relief. Hill suffered the loss after surrendering 15 earned runs, 19 hits and six walks over five frames while striking out one. The Maroon and Gold also committed all six errors of the contest. Ten different Lady Eagles produced a hit, with Cook, Grueser and Durst leading the way with three safeties apiece. Smeeks and both Rockholds were next with two each, while Fitzgerald, Hensley, Carleton and Sanders also had a hit apiece. Cook knocked in a team-best five RBIs and Tess Rockhold added three RBIs, while Grueser, Durst, Fitzgerald, Smeeks and Kennadi Rockhold also drove in two RBIs apiece. Tess Rockhold scored a team-high five times, while Grueser and Cook each touched home plate four separate times apiece.